The Astros were born during the National League's first expansion since the modern 10-team, two-league structure was established in 1901 (the Mets were the other team). A conglomeration of Houston businessmen headed by Judge Roy Hofheinz won the franchise and originally named the team the Colt .45's. The Colt .45's first loaded up against the Chicago Cubs on April 10, 1962, and shot them down 11-2 behind Bobby Schantz. Houston spent its first three seasons playing second-division baseball with manager Harry Craft at Colt Stadium, a new open-air park where fans had to endure the constantly oppressive Texas heat and swarms of mosquitoes. Two games of note did take place at Colts Stadium  a no-hitter won by Houston hurler Don Nottebart on May 17, 1963, and on April 23, 1964, Houston pitcher Ken Johnson became the first Major League pitcher to lose a complete game no-hitter; two errors, one by Johnson himself, cost him a 1-0 decision to Cincinnati. In 1965, the team and its fans escaped the mid-summer Texas misery by moving into a new structure originally called the Harris County Domed Stadium, but soon dubbed the Astrodome. The team changed its name in a nod-of-the-head to its new stadium and the burgeoning NASA space center nearby. The Astros inaugurated indoor Major League Baseball with a 2-0 loss to the Philadelphia Phillies on April 12, 1965 (although trivia experts like to point out that the Yankees played the Astros in an exhibition game to open the Dome a few days earlier and Mickey Mantle hit the first home run there). Four years later the Astros did something they had never done before  finishing at .500. In the 1970's they began to show improvement, finishing as high as second place in 1978. During this time the Astros featured players such as Jimmy "The Toy Cannon" Wynn, a young Joe Morgan, Cesar Cedeno and Bob Watson. Their pitching talent included Mike Cuellar, Don Wilson, Larry Dierker, Dave Giusti and Nolan Ryan. Although his record was only 11-10 with 200 strikeouts, Ryan joined the team in time to celebrate Houston's first division championship in 1980. Joe Niekro led the staff with 20 wins and the offense was anchored by Cedeno's .309 average, Jose Cruz's .302 average and 91 runs batted in, and the return of veteran Morgan, who had been traded away to help fuel the Big Red Machine in the mid-1970s. The Astros lost their first postseason series, a habit they would find hard to break. The Astros took one of the two half-season championships during the strike-marred 1981 campaign, but would not see the postseason again until its 1986 team blew away National League West competition by 10 games. First baseman Glenn Davis had 101 runs batted in (no one else had more than 79) and the pitching again carried the day with Cy Young Award winner Mike Scott (18-10, 306 strikeouts and 2.22 ERA) leading the starters and Dave Smith leading the bullpen with 33 saves. The Astros lost a legendary six game National League Championship Series to the Mets, with the last game in Houston one of the great games of all time. The Mets scored three in the ninth to tie the game 3-3, each team scored in the 14th inning, the Mets got three in the top of the 16th and the Astros scored two in the bottom of the inning before their frantic rally came up short. The arrival of Jeff Bagwell and Craig Biggio started a new era for the Astros in the 1990's and brought contender status virtually every year. Bagwell set new standards for Houston sluggers, even while he played in the spacious Astrodome. He had 39 home runs and 116 runs batted in when the strike ended the 1994 season (Houston was a half-game out of first). He became the National League's third-ever unanimous Most Valuable Player Award choice. Houston missed the wild card by one game in 1995 and faded in September of 1996, though Bagwell carried his weight with 31 homers and 120 RBI. With new manager Larry Dierker at the helm, the Astros won three consecutive National League Central titles in 1997-99, with a franchise record 102 wins in 1998. Bagwell becoming the team's first 30-30 man in 1997 (41 home runs and 31 stolen bases) and Biggio getting 50 doubles and 50 stolen bases the next season. But Houston could still not get over the hump in the postseason. They would be swept by Atlanta in 1997, lose in 4 to San Diego in 1998 and lose in 4 to, again, Atlanta in 1999. They would play the final baseball game ever in the Astrodome on October 9th, 1999. They lost to Atlanta 5-7, which put a sour note on the end of the Domes 35 years of Astros Baseball. Houston moved into Enron Field (Minute Maid Park as of 2002), a new, and more hitter-friendly ballpark in 2000, drawing three million fans despite missing a postseason berth. They came back to win the Central Division on the last day of the 2001 season, with Bagwell smashing 30 home runs, driving in 100 and scoring 100 for the sixth consecutive season. However, like every other postseason, the Astros could still not get out of the first round of the playoffs, getting swept by Atlanta again. This would lead to the resignation of manager Dierker. They would finish 2nd in the N.L. Central in 2002 and 2003, finishing 1 game behind the Cubs in 03. Houston, led by former Astros Phil Garner, made the playoffs again in 2004, sparked by the acquisition of Roger Clemens, who rescinded his retirement decision so he could pitch for his home town team. Having also signed Andy Pettitte from the Yankees, the Astros rode their veteran pitching to a wild card berth, which they would clinch on the final day of the season. This time they finally grabbed a postseason brass ring, defeating the Atlanta Braves in the first round, only to lose to the Cardinals in the National League Championship Series in seven games. They continued to hammer away at producing postseason success, and earned their first World Series berth in 2005. The veteran crew hurdled the Atlanta Braves, then tasted sweet revenge against the Cardinals, only to face the Cinderella story Chicago White Sox in the Series who erased 88 years of frustration with a four game sweep. The retirements of Bagwell in 2005 and Biggio in 2007, and the midseason trades of Lance Berkman to the Yankees and Roy Oswalt to the Phillies in 2010, signaled a changing of the guard for the Astros as they struggled to play .500 ball as the decade ended. On November 21st, 2010, then owner Drayton McLane Jr. announced he was going to put the Astros Organization up for sale. On November 17th, 2011, Major League Baseball approved the sale of the Astros to Jim Crane for a reported $680 million. Major League Baseball gave him $35 million as compensation for Crane agreeing to move the Astros from the National League to the American League in 2013. In 2011, the Astros suffered their first 100 loss season in franchise history, losing a total of 106 games. 2012 would mark the beginning of their youth movement with José Altuve, Marwin Gonzalez and Dallas Keuchel emerging on to the scene. 2012 was also their last season as a National League club in which they topped their worst record from the previous season with 107 losses. The Astros finished with 3999 wins and 4134 losses as a National League club. In 2013, they joined in-state rivals the Texas Rangers as they made the move to the American League West Division. They played their first American League game against the Rangers on March 31st and won 8-2. It would turn out to be the 1st of only 2 wins against 17 losses to the Rangers that season. The next game, Yu Darvish would nearly hand the Astros their 2nd Perfect Game against in as many years; they were on the wrong end of one against Matt Cain and the San Francisco Giants on June 13th, 2012. Darvish was 1 out away in the ninth with Marwin Gonzalez would single up the middle between Darvishs legs. They would, one more time, top their worst record as a club when they lost 111 games. The season ended with a franchise worst 15 game losing streak and they finished 45 games out of 1st place in the West. In 2014, they posted a 19 game increase from the previous year, winning 70 games. In 2015 they finish their first season above .500 in 7 years and made the play-offs for the 1st time in 10 years, when they went to the World Series in 2005. They clinched the 2nd A.L. Wild Card spot on the last day and won the A.L. Wild Card game against the Yankees. They became the 1st team in Major League History to win both N.L. (2004 & 05) and the A.L. (15) Wild Card. They would end up losing to the Kansas City Royals in the ALDS in 5 games. In Game 4, they held a 4 run lead with 6 outs to go but the bullpen gave up 7 unanswered runs in the 8th and 9th. Dallas Keuchel would win the Astros 3rd Cy Young Award and Carlos Correa won the Astros 2nd Rookie of the Year. 2016 was riddled with injuries and would finish in 3rd place in the A.L. West, 11 games behind the Rangers. Back in 2014, Sports Illustrated posted an article which prematurely named the Astros as the 2017 World Series Champions based on their use of analytics in putting together the team. The 2017 team started off with a bang going 38-16 through May. They would struggle in the summer months with injuries going 42-37 during June, July and August. At the End of August, Hurricane Harvey rocked the Gulf Coast of Texas and dumped 51 of rain throughout the Houston Area. The Astros were forced to move their home series against the Rangers to Tampa Bay. In a, minute before midnight, trade deal, the Astros brought Justin Verlander from the Detroit Tigers to shore up their rotation. In September and October, the Astros returned to form, going 21-8 to finish out the season. They clinched their 1st division title in 16 years on Sept 17th. It was their 7th division title & 3rd separate title (2 N.L. West, 4 N.L. Central). They would finish with the 2nd most wins in franchise history with 101. They would defeat the Boston Red Sox in 4 games in the ALDS. They faced the New York Yankees in the ALCS, the won the 1st 2 games at home and would go on to lose the next 3 in Yankee Stadium. Facing elimination in game 6, the Astros won 7-1 to even the series. In their 2nd ever game 7, the Astros would go on to win 4-0. They won the ALCS, capturing 2nd Pennant, first as an American League Club, becoming the 1st team in Major League History to win an N.L. (05) and A.L. pennant. They would go on to face the favored Los Angeles Dodgers in the World Series. They split the 1st 2 games in L.A., which included their 1st World Series game win after being swept in 05, and then split the 1st 2 games in Houston. With the series ties at 2 games apiece the 2 teams would go toe-to-toe in a slug fest Game 5. The Astros and Dodgers combined for 25 runs, 28 hits, 7 home runs, and 3 3-run home runs. The Astros would win Game 5 13-12 in 10 innings in 5 hours & 17 minutes, the 2nd longest game in World Series History behind Game 3 of the 05 World Series between the Astros and White Sox, to take a 3 games to 2 lead. The Dodgers won game 6 to force a Game 7. The Astros dominated Game 7 taking a 5-0 lead early. They would win 5-1 and claimed their 1st World Series title in the franchises 56th year. George Springer, who was on the cover of the Sports Illustrated article in 2014, was the World Series MVP. Jose Altuve would win the A.L. MVP award, claiming the Astros 2nd MVP. 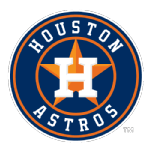 Peter Munro 2.2 " "
Kirk Saarloos 1.1 " "
Brad Lidge 2.0 " "
Octavio Dotel 1.0 " "
Billy Wagner 1.0 " "
Houston Astros Franchise Facts At-A-Glance by Baseball Almanac, Inc.
On May 30, 1976 , the Houston Astros set a team record for hits during a game with twenty-five versus the Atlanta Braves . Two months later, on July 2, 1976 , the Astros duplicated this feat versus the Cincinnati Reds . The Houston Astros set a team record for runs scored during an inning on May 31, 1975 , with twelve in the eighth inning versus the Philadelphia Phillies . Did you know that the Houston Astros team record for attendance on an Opening Day game is 51,668 which was set on April 6, 1999 ?